I recently finished processing and releasing my photos from Camp Hollywood 2014. Doing this occupied the majority of my non-dancing free time for the 7 or so weeks after the camp. I have a few notes and comments about why it took so long, and what I was thinking about. 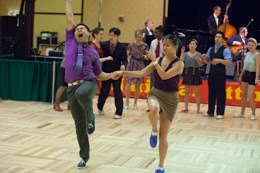 I'll spend a few posts describing what I did to edit this photo (from Amateur Lindy Finals) and my goals in composition. Then I'll apply the same ideas to a couple other photos. Then I'll wrap it up discussing my overall process. Above is a (slightly contrived) before and after comparison of one of the photos from that set (this one was from the Amateur Lindy Finals on Saturday). I always shoot in RAW anyway, but it is especially important when making big adjustments with color temperature. One of the first things I do is choose a color balance (temperature and tint) for the overall look of the photo, mostly looking at the background. 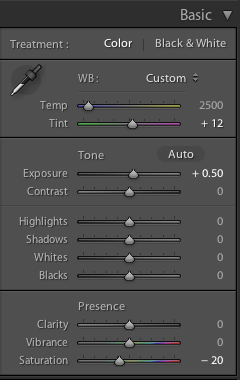 Color temperature is recorded as metadata suggesting how to interpret the RAW color data, but in LR, I can choose to interpret it differently. JPG will bake in that interpretation and you will lose a lot of flexibility. The first three are the most common settings* I would use indoors. Light from a flash is typically very cool (blue), so the raw data will have blue blasted out much more than the reds and greens. When we observe it in person, our eyes adjust and make objects we think are white look white. But the camera (or LR) needs to weight the red and green more and the blue less. Similarly, for Tungsten, the light will be warmer, so there will be more yellow, adding red and green to everything, and not so much blue. To compensate, LR may boost the blue and/or take down the red and green. Florescent is often a little green, so I think it's boosting the red. My "As Shot" is a very low temperature, which I think is interpreted as going toward red maybe boosting the greens and blues. primary/dominant lights were overhead chandeliers with large diffuse panels. The panels were somewhat yellowed. Sometimes, there were LED spots coming from above the bandstand that were on a chaser, so they would change every few seconds. (more on that in Part 2) These mostly showed as a rim. Given that, I think the lights in the room were probably somewhere in the 2500-2700 range, sort of Tungsten-esque, so the tungsten preset looks pretty accurate. "Flash" boosts the already strong reds and greens which makes the whole photo look yellow/orange. "Tungsten" may look accurate, but I might not want accurate. Even when I was there, I thought, "This is a yellow, yellow room." That's not how I wanted to remember it. Also, it's hard to use any color for emphasis because it's all a little yellow. The "As Shot" image still looks a little green, but I'll explain how I got there. When I'm first approaching the set, I'll use some of LR's tools to search for the white balance. One tool is setting it to "Auto" and LR will try to guess the dominant light color. But in this case(upper left), I think it was still too warm - still close to Tungsten. Another is the White Balance Eye Dropper tool. Use that to click on a point in the image that is supposed to be white, and LR will find the temperature/tint combination that will make it so. Here, I show the results of a few candidates that had subtle differences with how much in shadow they were and what they were really getting lit by. Of these, I thought the upper right was the most appealing(using Henry's shirt in the background). And 2500 is consistent with where I landed when shooting previous years in this room at Camp Hollywood. From shot to shot, I think I actually do vary from 2400-2600 in the final. But on camera, I set it at 2500 for a quick preview. On the camera, it is harder to set the tint, so I'm slightly at the camera's whim for the "As Shot" but I know I can fix it quickly and easily. In editing(actually on another photo) I took that as a starting point and experimented with color temperature just a little bit more to figure ot what I wanted. 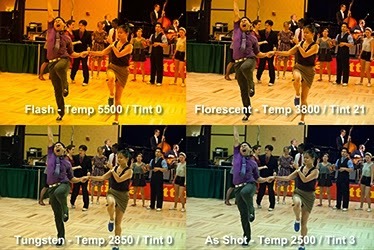 In broad strokes, LR labels its controls to show the color temperature mostly controls the Yellow/Blue axis and Tint is the Green/Magenta axis so I can "un-green" it by raising the tint. Looking around the photo, one of the things that draws my eye is the background red and yellow "Camp Jitterbug" banner on the stage. Often, it is the most saturated thing in the shot. In this case, I'm kind of lucky because Andrew's shirt is pretty saturated, but even so, I don't want the back banner to compete for focus, so I try to take a little of the bite out by reducing the saturation. In fact, I like to reduce it with -20. All that and Exposure +0.5 too. Now, this is a still little dark. I often shoot underexposed - I usually want a fast shutter and to keep the ISO as low as I can. Sometimes, I can be a little wishy-washy about the aperture when I'm trying to feel out the depth of field. And I know that I will be editing in LR, where I easily can move 2 stops in either direction without degrading the image. The point being that I know that I could shoot to get the right exposure in-camera, but with the ability to edit the raw image in LR, it wasn't worth compromising the other settings. Increasing the exposure with 0.5 seems to work well overall for the set, so I used that for a preset, and as it turns out, that's what I kept for this image. I also set the Luminance smoothing to 40 down in the Noise Reduction section, but that's not really relevant to the discussion. Though it took a couple years of experimenting to land on this as a preset, sliding the knobs around to try to find something that works only takes a minute or two. And once I chose it as a preset, I can have LR apply the preset on import, so I effectively get up to this point for free. That's a long story of how I came up with the preset I used for my Camp Hollywood 2014 photos. Well, most of the story anyway. There's one more factor that I'll discuss in my next post, but it wasn't a big factor in processing this particular photo, and there are better examples to use to discuss it. Also, you can see that the last photo in the Exposure section doesn't match the Final at the top of the page. After the brief detour, I'll come back to this photo and discuss more of the editing process.